Horseshoes is an easy game to play for all ages, but it's also a competitive sport. Having a horseshoe pit in your backyard might make you the envy of the neighborhood -- and designate your yard as the official headquarters for some serious tournaments. Building a simple horseshoe pit is not very expensive or difficult to accomplish. Screw two of the 6-foot boards to two of the 8-foot boards at the corners forming a rectangular frame using the wood screws and power drill. Use two screws in each corner of the frame to attach the boards together. Repeat the process with the other 6-foot boards, 8-foot boards, and screws so that you have two identical rectangular frames. Position one of the frames in the desired location of one end of your horseshoe pit. Place the second frame 36 feet away, measuring from the front of one frame to the front of the other. Align both frames so that the longer sides of the frames are parallel with each other and the playing area. Draw lines on the ground around the frames using the lime. This will give you an outline of each pit. Remove each frame while being careful not to disturb the lines drawn with lime. Dig out the grass and dirt inside the rectangles you drew with the lime using the shovel. The holes should be about 2- to 3-inches deep and level with straight edges on all four sides. Place the frames in the freshly dug holes and check for fit. The frames should fit snugly while sticking out about a half an inch to an inch around the edge. Tap the frames with the sledgehammer to help properly fit the frame into the holes. Hammer a metal rod in the center of each pit using the sledgehammer. Measure the amount of rod that is still above ground with your tape measure; you want about 14 inches visible. Keep driving the rod into the ground until you get to this measurement. Fill each pit with sand evenly and up to about the same level as the ground, leaving some of the wooden frame exposed. Try to build your horseshoe pit in a clear and level playing area with at least 40 feet of space. Make sure there is enough clearance above your horseshoe pit as well. Trim or remove any tree branches or objects hanging over your pit. For better playing conditions, you may want to fill your pits with blue clay instead of sand. Don't build your horseshoe pit in a high traffic area or next to a walkway where people may get struck by horseshoes during a game. 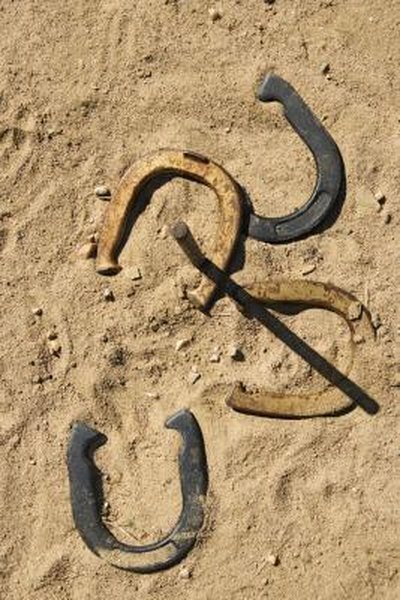 Don't build your horseshoe pit too close to your house, shed or driveway to avoid damage from wildly thrown horseshoes. Horseshoe Pitching: Building Your Own "Backyard Horseshoe Court"